Greater Boston home prices keep setting records! 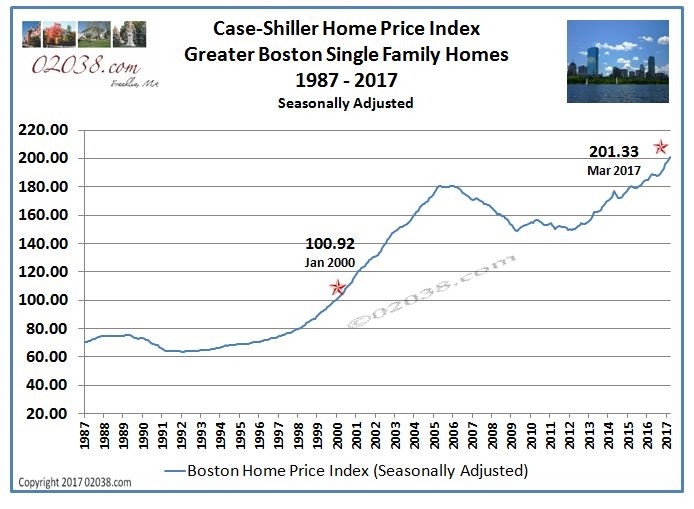 The seasonally adjusted Case-Shiller Home Price Index for Boston climbed above 200 for the first time in its 30 year history, according to figures released last week by publisher S&P Dow Jones. The Boston Index stood at 100.92 in January 2000. The current Index reading of 201.33 indicates that Greater Boston home values have doubled in the last 17 years. Greater Boston home prices as tracked by the Index have rocketed higher since January 2016. The first quarter of 2017 saw very strong home sales in the Bay State with sharply higher prices. This came on the heels of a burgeoning Massachusetts real estate market in 2016. The Boston Index is currently 8.9% higher than its January 2016 reading of 185.95. In the previous market cycle, Greater Boston home values peaked in November 2005 at 180.81 on the Index. Severe financial instability culminating in the Great Recession caused Boston home prices to nosedive from 2006 through 2009. 2012 saw the start of the home price rebound in Greater Boston, which has essentially continued unabated until today. Current market conditions in Massachusetts are grossly overheated. There’s a fundamental imbalance in the market with hordes of frustrated buyers engaging in bidding wars for a woefully inadequate supply of homes for sale. Today’s conditions are a far cry from how things stood in 2012. 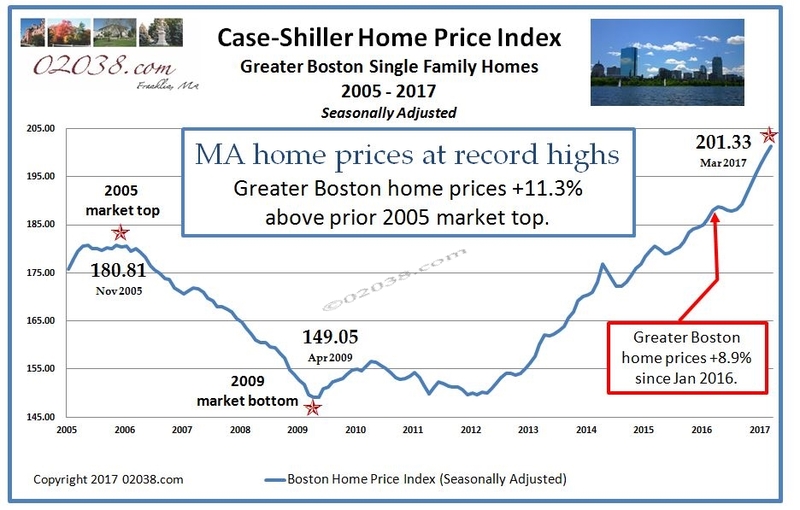 Looking back with the benefit of hindsight, 2012 was THE time to buy a home in MA. Sales volume was picking up and prices were still near their market cycle low. Investment wizard Warren Buffet even called it, saying in February 2012 that there was a buying opportunity in US housing. Back to the present: if you own a home in Massachusetts, you likely have a lot more equity in it now than you did just a few years ago. If you are on the fence about selling your current residence, you might be wise to heed classic contrarian investing principles and sell now while you are in the midst of the current price run up. You’ll make the most money by selling when there is so much buyer interest. 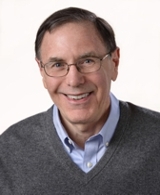 Contact Warren to review your best home selling strategies to maximize your sale proceeds!